Artificial Intelligence: what is it? How will it impact our lives? How will it be used? Will it actually take over? As the field emerges and becomes more widely discussed, social media’s role in shaping public debate answering these questions and more has never been more apparent, with more of us turning to social media for news. Influencers in this space have the unique position & unprecedented opportunity to drive this global conversation in a way not previously available for established fields such as oil & gas, through engaging directly with the public – potentially disrupting the role traditional media outlets held. So, how do the public interact differently with Influencers & the Media? How much more engagement can an influencer drive for a media outlet? Who are the influencers that media outlets are currently referencing? These are some of the questions this report will answer. Who wins the battle on Reach & Engagement between influencers & Media Outlets? Below is a comparison of the average audience size for influencers & the media, their activity level & their audiences’ engagement on their AI posts over the past 3 months. 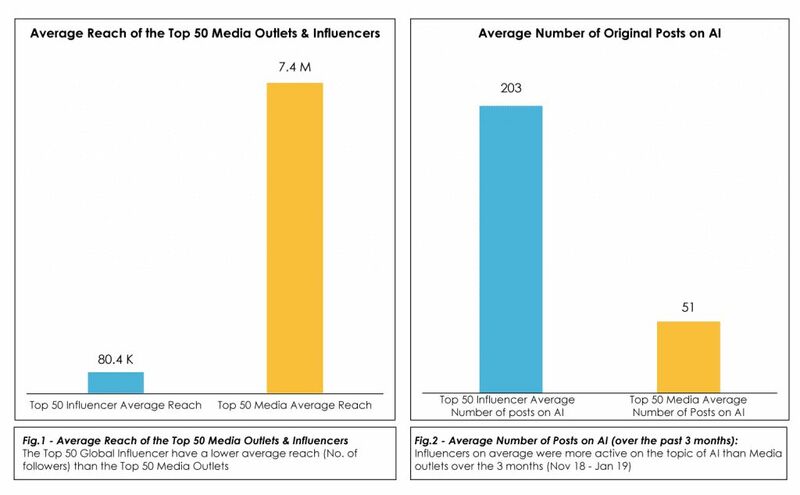 The Top 50 Media Outlets had a 93x larger reach on average than the Top 50 Influencers yet, despite this, influencers’ average engagement per follower on AI posts was 128x higher than that seen for media outlets. 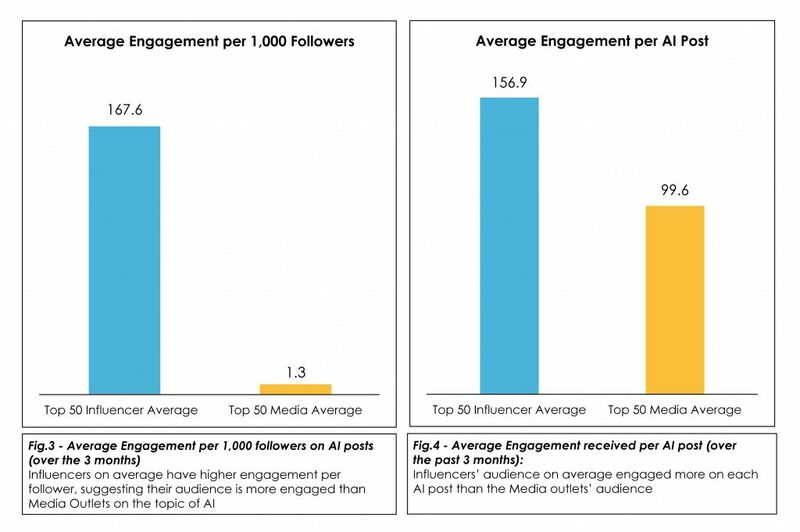 This trend was also seen when looking at average engagement per AI post – where influencers received 58% more engagement than media outlets. So, what does this mean? This could be evidence to show that the public are more likely to engage with news & debate around AI when this comes from an influencer rather than from a media outlet. Increased engagement from Influencers’ audience was also seen when influencers were ‘behaving’ like media outlets – by sharing links to content. 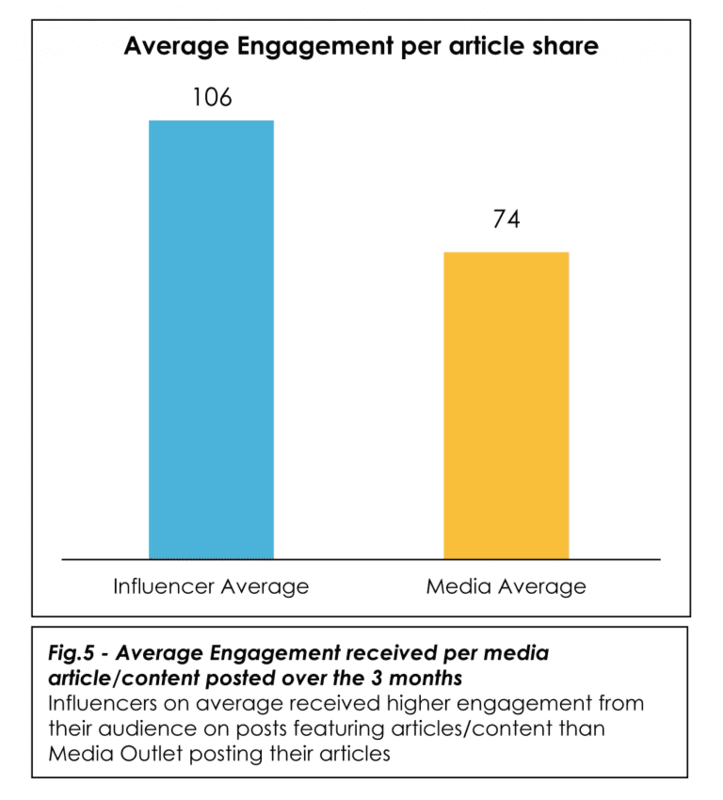 In this case, influencers received 143% more engagement per 100 article shares than media outlets. “Artificial intelligence is a broad field that brings various online media communities together. This diversity among AI influencers can produce divergent ideas and that’s a key aspect towards a healthy debate”. Phil Siarri, founder of media property Nuadox. 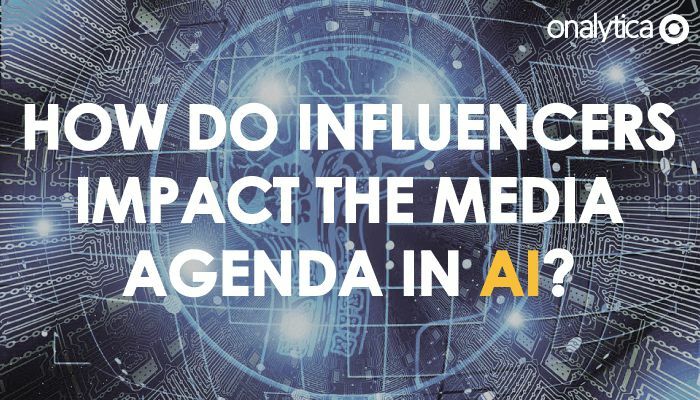 Which media outlets do global AI influencers engage with the most? We analyzed how many interactions there were between the Top 3,000 Global AI Influencers & the Top 1,000 Media Outlets to understand which Media Outlets are engaged with the most by influencers. In this case, engagement means the number of Mentions & Retweets that particular outlet has received from our Global AI Influencers. These engagements are an indication of when influencers are replying to Media Outlets’ articles or re-posting their content both with their own opinion or without. Over the past year, Forbes received the most inbound engagement from influencers on the topic of AI – receiving 4,303 Engagements from 3,000 Global AI Influencers. 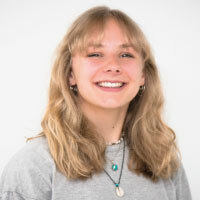 This success reflects Forbes’ global prominence as a publication – despite not specialising in AI, the outlet is frequently used as a news source for stories on AI. How much engagement do the Top 50 Influencers drive for Global Media Outlets? The below table shows how many times the Top 50 Influencers shared articles/content from Top 1,000 Media Outlets on the topic of AI, alongside how much engagement (in the form of Likes & Retweets) these influencer posts received. This gives an indication of the role influencers have in helping media stories reach a wider audience, with influencers creating a more curated news feed for their audience. Who are the top influencers influencing the Global Media Outlets over the past year? The previous sections of this report have focused around how the end audience (the general public) engages with influencers & the media differently, showing how using influencers can help support the public’s engagement with media content. Understanding which influencers are being referenced & mentioned by the media can indicate how media outlets are currently engaging with influencers, whether that is through influencer contributed content or through using quotes from influencers to lend credibility to an article. We have analysed the interactions between Top 1,000 Media Outlets & Top 3,000 Global AI Influencers over the past year within the AI & Tech space. From this we have identified the 18 influencers who received the most mentions from the Global Media Outlets. The below table is ranked by a combination of how many times the influencers have been mentioned by Media Outlets, and the prominence of these outlets. All analysis on AI, including Influencer & Media Outlet selection, was based on the global AI conversation covering 5 languages: English, Spanish, Portuguese, French & German. Firstly, we identified the Top 3,000 Global Influencers on AI based on topical authority, resonance and relevance from our global pool of half a million influencers. From this list, we identified the Top 50 Influencers on AI based on Topical Authority (a measure of influencers’ expertise on a topic). These are the influencers referenced when the Top 50 are mentioned in this report. For this report, journalists, & politicians were excluded from the definition of influencer. From 4,000 Media Accounts worldwide, the top 1,000 within the Tech space were identified. From these, we identified the Top 50 Media Outlets on AI by potential impressions of their AI content on social (number of tweets on AI over the past 6 months x the handle’s reach). All analysis is based on Twitter, as lot of public conversation around AI occur on Twitter. Get in touch with a consultant here at Onaltyica to learn how you can integrate influencers into your marketing strategy.